Speedmonkey: What's Under The Tarp? We all love a mystery, a whodunnit, a thriller. In the car world the equivalent mystery is the car under the tarpaulin. Take a photo of a car under a tarp and you're guaranteed to get petrolheads on social media in a flutter of, "It could be..." and, "I think it's a..."
Sometimes the car under the tarp is easy to identify, maybe by a distinct shape (Beetle, Mini etc) or a hint of unique wheel peaking from under the cover. Sometimes it's much tougher. A heavy tarpaulin evens out the bodywork and creates a generic shape, and if the wheels are aftermarket then you've no chance. Take the photo above. Respondents on twitter reckoned it was, or could be, a Camaro, R34 Skyline, Corvette, Audi A5 coupe or Honda NSX. And it's identity is still a mystery. I walk past it most days and think it could be...a Corvette or Skyline or maybe a Mitsubishi or some other Nissan coupe. I once went to a work colleague's house and spotted a car under a tarp in her drive. I wracked my brains but couldn't work out what it was. Some time later I asked her, "A silver Mercedes," was the answer. "Which?". "Oh I don't know, some sports car." From that little info I'd say it was an SL. 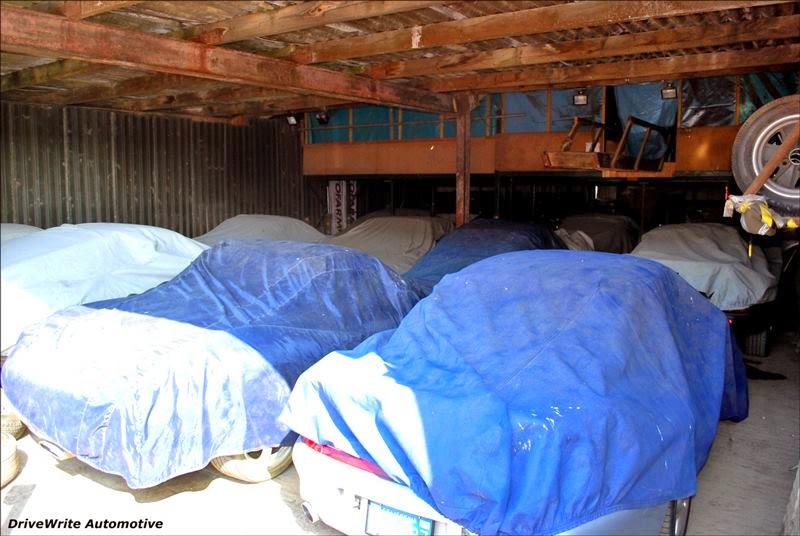 Geoff Maxted of DriveWrite recently posted this photo on his Facebook page asking "What's under the tarps?" What's under the tarps in Geoff's photo? I got them all right based solely on the wheels poking out from under the covers. Mystery solved. Satisfaction. That was an easy one, but not all are, which is why us petrolheads love a game of what's under the tarp.